A brave article by a Republican Congressman from Southwestern Texas. Jonah Goldberg compares Trump and his cult to the hippies who roamed San Francisco in the 1960s. @6:00 Impeach, of course. If true, it is nothing more than his duty, and surely he knows that. @6:10 Poor Jonah, he’s now resorted to consigning non-existent persons to hell, picture propaganda (complete with evil lighting of the President), and writing an ode to an obscure newly minted Slavic state for whom he thinks WW3 might be justified. He should have led with the dog update, and stopped. Looks like the US is determined to continue meddling in the internal affairs of other nations. With all the millions being spent on Ukraine, I hope and trust that there will be no caterwauling against domestic spending this fall when it’s time to draw up the budget for next year. Or another total fraud from a deep state, never-Trumpers and the equally fraudulent NYT. …….The “mistakes” of U.S. foreign policy impose staggering costs on tens of millions of people overseas. It is woefully inadequate simply to “acknowledge” them after the fact and then return to the same reckless ideological assumptions that made those “mistakes” possible. Indeed, it is not enough to call them mistakes. They need to be described accurately as crimes and abuses of power. If the U.S. can be a force for good in some situations, it is important to realize that it has been a destructive force in the parts of the world where it has been most willing to use force to achieve its goals. Across the Middle East and North Africa in particular, the U.S. has started, joined, or supported wars in the last two decades that have killed hundreds of thousands of people, displaced millions, and put many millions more on the cusp of starvation. All of this devastation hasn’t made the U.S. more secure, and continuing down this path will only create more enemies. Since the end of the Cold War, the U.S. has frequently used force when it didn’t need to in places where it had no reason to be involved against people that posed no threat to America. There is nothing good about that, and we should stop telling ourselves that there is. As we speak, the U.S. is aiding and abetting the Saudi coalition in Yemen as it commits war crimes against civilians and causes the world’s worst humanitarian crisis. The U.S. has made itself the enemy of tens of millions of Yemenis who never did anything to us and posed no threat to anyone. Neoconservatives have nothing to say against U.S. support for the war on Yemen, because they are in favor of it. When the politicians aligned with them have talked about it, they have dutifully echoed Saudi talking points and voted against any measure that might restrict or halt U.S. military assistance to the coalition. As long as such despicable policies continue, conservatives and all other Americans should be focused on stopping these abuses of American power. Neoconservatives have absolutely no interest in doing that, and that means their message could not be less relevant to our current foreign policy woes. The anti-Trumpers can’t make up their minds. So, the "Deep State" that up until now was "a right-wing conspiracy theory" just became "the only thing standing between us and the abyss." Or just our power abusing intelligence agencies. After all the selective leaking to frame the Trump administration for obstruction, after a U.S. presidential campaign was spied on by the opposing Party’s administration, after years of botched or politicized intelligence assessments, after years of arming bad guys around the world, and after multiple revelations of spying on Journalists, Congress, and American citizens — of course it is appropriate to doubt the U.S. intelligence agencies. Yes, Russia meddled in our election. But the degree to which Russia interfered — and favored Trump — matters. This affects the Mueller investigation, the amount of power we give the intelligence community to combat this interference, and U.S. foreign policy with the world’s other preeminent nuclear power. And the degree to which Russia interfered is still open for debate. We can be certain about a few things. First, there was the hugely overblown and even pathetic social media campaign run by a Russian troll-farm. This campaign mostly appeared in non-swing-states, and the majority of its spending occurred after the election. In fact, only $46,000 was spent before Election Day, which should be compared to the Trump and Clinton campaigns’ combined $81 million spent on Facebook ads. Russia also meddled by launching a massive spear-phishing campaign — in which a hacker sends a fake email that tries to trick people into giving out their log-in information — that surely targeted the Democratic National Committee and the Clinton-campaign. But this “hacking” campaign also targeted Republicans, a fact special counsel Robert Mueller didn’t include in his indictment of 12 Russians that occurred days before the Trump-Putin summit. Yet Russian spear-phishing and hacking is nothing new, just like Chinese hacking is nothing new. This matters, because if the Russians targeted both sides it sounds more like routine interference—that should still be condemned—than a super-secret spy plot to change the course of American history. “America can still be America without the intelligence bureaucracy we have today, or even with our intelligence-gathering back in the control of the Pentagon. The standalone intelligence bureaucracy is, after all, far younger than our republic, and has a terrible track-record. Andrew Sullivan has an interesting theory. HRW, My niece and her family continue to enjoy Canada. My great-niece is celebrating her 4th birthday in the Yukon Territory. They took your advice and bought off-road tires for both the truck and trailer. Reports are that the Canadians have been very friendly to the visitors from Texas. The Republicans in Congress probably don’t see the humor in this. However, conservatives who have been disappointed with their failure to confront idiocy are thinking they may get just what they deserve. And here’s a surprisingly honest look at why we are meddling in other countries internal affairs, or dropping bombs at 2 million a pop in needless wars. Here’s the weird bit: nobody seems to care. If any other government department spent as much and accomplished as little, the populace would be in arms, complaining about wasteful government spending. Instead we mumble “Thank you for your service” and increase defense appropriations……..
…..Maybe the extravagant expense of the Pentagon budget is a feature, not a bug. Maybe no one objects when we spend a quarter of a billion dollars ineffectually bombing Syria or several trillion ineffectually invading Iraq because these days war profiteers make their money not by looting their enemies’ cities, stealing their land, and selling their women into slavery, but from their own governments’ spending. ….Trump’s refusal to challenge Vladimir Putin’s claim at Helsinki that his GRU boys did not hack Hillary Clinton’s campaign has been called treason, a refusal to do his sworn duty to protect and defend the United States, by a former director of the CIA. The New York Times ran a story on the many now charging Trump with treason. Others suggest Putin is blackmailing Trump, or has him on his payroll, or compromised Trump a long time ago. …..A month ago, the never-Trumpers were comparing the separation of immigrant kids from detained adults, who brought them to the U.S. illegally, to FDR’s concentration camps for Japanese Americans. Other commentators equated the separations to what the Nazis did at Auschwitz. Using Occam’s razor, the real explanation for this behavior is the simplest one: America’s elites have been driven over the edge by Trump’s successes and their failures to block him. Worst of all, Trump clearly intends to carry out his campaign pledge to improve relations with Russia and get along with Vladimir Putin….. They intend to break Trump and bring him down, to see him impeached, removed, indicted, and prosecuted, and the agenda on which he ran and was nominated and elected dumped onto the ash heap of history. ….Trump is edging toward the defining battle of his presidency: a reshaping of U.S. foreign policy to avoid clashes and conflicts with Russia and the shedding of Cold War commitments no longer rooted in the national interests of this country. Yet should he attempt to carry out his agenda—to get out of Syria, pull troops from Germany, and take a second look at NATO’s Article 5 commitment to go to war for 29 nations, some of which, like Montenegro, most Americans have never heard of—he is headed for the most brutal battle of his presidency. By cheering Brexit, dissing the EU, suggesting NATO is obsolete, departing Syria, trying to get on with Putin, Trump is threatening the entire U.S. foreign policy establishment with what it fears most: irrelevance. Bret Stephens has the transcript of the Trump/Putin meeting. I am not the only conservative who has turned primarily to satire since conservatives and Trumpers can not agree on basic facts. This liberal admitted that when Trump humiliated himself and the country in Brussels and Helsinki, it was conservative Never-Trumpers and not liberals who spoke out most effectively in defense of the Free World. Debra, It beats trying to convince Trumpers that Obama didn’t really put “tapps” on Trump’s phone and that Putin and Kim probably should not be trusted so readily by Dear Leader. There are several Trump jurisprudence stories. First, as expected Trump and his former associate and lawyer Michael Cohen are not happy with each other. As most of us already knew, The National Enquirer functioned as an arm of the Trump campaign. There are a lot of slimy New Yorkers, and poor Mueller is going to wind up talking to most of them. The “Manhattan Madam” is a close friend of Trump buddy Roger Stone and may be questioned. If there was collusion or coordination between Trump and Russia, it most likely involved Roger Stone. Meanwhile, Ecuador may soon turn Julian Assange over to British authorities. Oh look… more decade old accusations…. We have already established that Republicans lose their ability to understand economics when they join The Cult. But Bernie Sanders and Elizabeth Warren also like tariffs. The ignorance of protectionism is truly bipartisan. Not a whole lot here that is new. It does make you think: Why would the Trump campaign bring Carter Page on board? There is an answer: No decent foreign policy advisors wanted to work for Trump. Nice attempt at downplaying that Ricky. What it shows is that they used dossier as justification despite it being fake and unproven. They lied about it as well, both to the court and the public. Like I said, one crime is too many. One is too many, this is unconscionable. These are not victim-less crimes. Conservative Charlie Sykes presents serious responses which Republicans can take after Trump chose to become Putin’s lapdog. Maureen Dowd has given up being serious with the Trumpers. She would rather tease and torment. I understand. Ironically, a serious article about Trump’s activities over the last week sounds as humorous and ridiculous as Dowd’s column. An excerpt from the article. Who would have ever guessed that the idea to say he accidentally said “would” rather than “wouldn’t” came from Trump himself? The frantic conversations over what to do began on the flight home. While the president groused about the difficulty of the questions posed to him by American journalists, John R. Bolton, the national security adviser, mostly stayed away from Mr. Trump. Mr. Bolton wrote down four bullet points aboard Air Force One that he believed were relevant, including that Mr. Trump should acknowledge that he believed the intelligence agencies’ findings on the Russian meddling. He relayed them to the press secretary, Sarah Huckabee Sanders, although it was unclear whether the suggestions were delivered to the president. On the plane, Mr. Trump’s mood vacillated from snappish to upbeat. He asked advisers once again about the Democratic National Committee server that was hacked (he had raised the server issue while standing next to Mr. Putin), and why cyberintruders had not penetrated Republican National Committee systems. In the days since arriving back home, Mr. Trump has surveyed almost everyone he has talked to about his performance in Finland, but few told him just how poorly it had gone. Aides suggested different options for “changing the narrative,” without seeming to realize that a simple story would not suffice. Regardless of what the President says, I think we all know that Russia (and perhaps other countries) tried to hack, and to some extent were successful in hacking, the RNC and DNC. As Rand Paul stated the other day, this is not even unusual. But that they were so successful and released the documents to the public, is unusual. And this goes to the heart of our security as a nation. If the US doesn’t take it’s own security seriously, there will be more of the same and with worse consequences. Secretary Clinton’s gross negligence, and the dismissive, partisan way in which it was handled, does not bode well for our national security. It sets a very poor precedent for judging the current administration’s handling of classified material (which I also suspect is very lax), and it places national security squarely in partisan territory. We can squeal all we want about Russia, but they are just doing what all nations do. And if we do not raise the bar and hold our own officials accountable for their handling of classified information, then we can hardly blame Russia or any other country for our compromised position. In my opinion, James Comey would be a good place to start, since he has been involved in both administrations and his leaking of classified documents for partisan purposes is not in question. We need some standards enforced publicly and internally, and a high profile offender like Comey fits the bill. I want to see another week’s worth of polling results, but the stability here is absolutely stunning. We have just had a President beclown himself before the entire world in Brussels, attack our allies and then go to Helsinki and act as the most docile and naive stooge to Putin. He then tried half-hearted attempts to lie his way out of his prior statements. And none of this moved the polling needle at all one way or the other! About 42% are in the Cult and they have signed up for life. About 53% are opposed to Trump and they are also set. Most of these are Democrats, but this group also includes a small group of educated conservatives and intelligent independents. Trump and the Cult have their own facts, their own “rule of law”, their own “economics”, and their own post-war history. They even have their own spelling, grammar and vocabulary. I think we have learned a great deal about each other over the last couple of years. The communication has sometimes been rough, but at least we are talking. The rest of the 53% doesn’t want to hear any more from the Trumpers. They only want to defeat the Trumpers. The 53% might spell trouble for Republicans in November if the 53% were unified, but they’re not—they’re all over the place. Even the Democrats can’t agree within their own party. Debra, 1. Exactly what classified information did Comey leak and how did those leaks in any way jeopardize the security of our country? 2. As a follow-up, I believe that Trump’s behavior toward Comey in the early months of 2016 was caused by profound ignorance rather than treason. However, if Comey believed that Trump had likely been compromised by the Russians, did he not have a duty to sound the alarm? Debra, the 53% is unbelievably unified. Every day I read pleas from Dems, disaffected Republican women and Northern NeverTrumpers to vote Democrat this November. I think the Cult is also unified, but Trump’s constant idiocy tends to depress the morale of the more intelligent cultists. The morale of the 53% is high. I don’t think a general witch hunt is necessary or desirable in order to emphasize to the bureaucracy the importance of maintaining security. One or two good public prosecutions with devastating penalties would be sufficient. Public servants need to know definitively what the classification parameters are, and that the consequences for violation will be severe and certain. For most bureaucrats, the certain loss of pension would be a deterrent, and for others, the thought of fines stiff enough to ensure a life of penury would suffice. I think Comey is a perfect candidate for such a prosecution. His loud-mouthed arrogance and public book tour all proclaim his desire to be the poster boy for something. I think we should let him. Arguable? Debra, Please argue how that particular information damaged national security? I would argue that it enhanced national security by exposing the fact that a rogue president was clumsily trying to interfere in an investigation of foreign interference in a US election. Debra, Here are things about the Trump Presidency that did not surprise me. I predicted them. 1. He would continue to be a pathological liar and this would cause problems at home and abroad. 2. His dishonesty and ignorance would make him an international buffoon and disgrace America. 3. His protectionism would drive our former trading partners to seek new deals with others including China. 4. His profound ignorance about his duties and the nature of our government would make him ineffective as an executive. 5. His combination of ignorance regarding major public policy issues and extreme intellectual laziness would make him useless in building support for conservative legislative solutions. 6. His toxic combination of malice and incompetence would drive the young and suburban women from the Republican Party. 7. His weird combination of isolationism, protectionism and stupidity would poison our alliances, make him an anathema to the vast majority of the world and mark the end of The American Century. The only real surprise to me was that 42% of Americans joined his cult. However, the 2016 primaries gave us a clue that something was wrong in the brains and hearts of many Republicans. From where I sit, both “parties” are in disarray. I doubt that consensus within the ranks on either side will be easy to reach in the near future. Everyone is adamantly against someone or something. Everyone’s in a perpetual uproar. And that’s about where it all just sits for now. I will say the Democrats may have an easier time regrouping than conservatives and Republicans going forward. They perhaps have more of the outrage and anger on their side for the time being and that alone can temporarily unify. But unify behind what, exactly? What we’ve learned about RW: He is a conservative who now acts like a liberal (because of TDS?). DJ, You hit the nail on the head. It is much easier to unify against someone or something than to unify for something. As we now know, the Rs were ideologically diverse in 2010 and 2014. However, they “unified’ in the midterms against Obama and Obamacare though they had no alternative to Obamacare. Trump is viewed as a clear and present danger by the 53%. They will remain unified against him and the Republicans who have acted as his stooges (think Nunes) until Trump is gone. Tychicus, Who is deranged? Who is acting like a liberal? So what have we learned from their Saturday night document dump? “We are familiar with the Friday afternoon document dump. It’s a standard tool of political scandal management. What are we to make of the Saturday night document dump by which the Department of Justice delivered the heavily redacted documents comprising the Carter Page FISA warrant application to the New York Times and other news organizations that had sought them under the Freedom of Information Act? Charlie Savage’s New York Times article draws no inferences from the timing. I say the Saturday night document dump resets best scandal management practices. These documents were not released on Saturday night because the FBI and the Department of Justice are proud of themselves for what they reveal. That it does, and none of it good. There’s a reason Ricky and his liberal choices for news want to downplay it. Because it proves them wrong and shows that their false stories were used as a basis to get a warrant. This is conspiracy and collusion. “Given that most of the application that Barack Obama’s Department of Justice submitted to the FISA court to obtain a surveillance order on Carter Page has been redacted, what we can say about the application is limited. Still, a few things stand out. But Page has never been charged with anything. Accordingly, the least we can say is that Obama’s FBI and DOJ were wrong. The “identified U.S. person” is Glenn Simpson, the head of Fusion GPS. Source #1 is Christopher Steele. The DOJ’s statement that “the FBI speculates that the identified U.S person [Simpson] was likely looking for information that could be used to discredit Candidate #1’s [Trump’s] campaign” could only have been an intentional effort to deceive the FISA judge. The FBI was perfectly well aware that the Hillary Clinton campaign and the DNC hired Simpson through their lawyers, and the purpose of doing so was to attack candidate Donald Trump. References to “speculation” about “likely” motives are entirely dishonest. “South Carolina Rep. Trey Gowdy said Sunday that, after 18 months of congressional investigation into possible collusion between the Trump campaign and Russian government, he has yet to see a “scintilla” of evidence showing that there was coordination between the two sides. Moving the goals posts as narrative after narrative collapses. Sigh. Carter Page was on with Jake Tapper this morning. He acted about as guilty, dishonest and stupid as Papadopoulos, Nunberg, Little Trump, Stone, Nunbetg, and Big Trump himself. Rubio followed and did a good job. He appeared embarrassed that a Republican would employ someone with the background of Page. He also basically supported the FBI and the four Republican judges who signed FISA warrants re: Page. Mueller will eventually tell us the truth about Page. I am expecting a few laughs. Ricky, that’s a pretty unfair characterization of the C. Page interview – he didn’t look guilty at all. He actually did a fine job of handling Tapper’s questioning, despite the fact that Tapper kept going for a ‘gotcha’ moment, kept putting words in Page’s mouth, etc. As Tapper asked his questions, Page is almost laughing at him b/c of how ridiculous Tapper was coming across. As Mueller and Comey have amply demonstrated, just because they’re R’s doesn’t mean they aren’t partisan hacks. Now for the heads of the Hydra……. Make sure they’re under oath too. “House Judiciary Committee Chairman Bob Goodlatte confirmed to Fox News Channel’s Maria Bartiromo Sunday morning that his committee among others want former CIA Director John Brennan and other former Obama officials to testify before its members. Looks like another narrative fail. Now that we know Dems were taken in as well, this story will now disappear. “Accused Russian agent Maria Butina had wider high-level contacts in Washington than previously known, taking part in 2015 meetings between a visiting Russian official and two senior officials at the U.S. Federal Reserve and Treasury Department. Further proof the special counsel was a waste of time and money, and totally unnecessary. And that Ricky is wrong. Again. “What is going on? I asked a few former federal prosecutors if they saw any messages in Mueller’s move. The takeaway: These aren’t encouraging developments for those longing for a big collusion/conspiracy/coordination indictment from Mueller. Ricky: It’s amazing that you don’t see the obvious illicit practices by the FBI and DOJ over the past couple of years. When you have members of the Special Counsel’s team discussing how they are favoring their favorite candidate and saying they need to have an insurance policy if she doesn’t win, that should cause concern for even the least observant person. Couple that with another statement by one of the same members texting that POTUS wants to be briefed on everything they do is another cause for concern. There didn’t seem to be any hesitation by the federal law enforcement apparatus to use the unvetted dossier to obtain a warrant to monitor the activities of US citizens involved in only one campaign, with the stated purpose of looking into the activities of the Russians, without briefing the President-elect. They briefed several other non-law enforcement cabinet members. 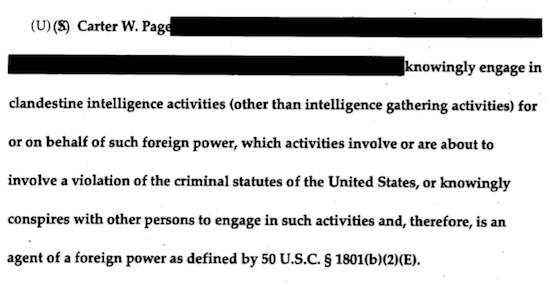 Do we know the crime C. Page committed to justify the FISA warrant? He hasn’t been charged with anything. Would you believe the FBI number two who said if it were not for the dossier, there never would have been an application for a FISA warrant? Words from McCabe himself, in his testimony to Congress. Did Hillary and the DNC collude with the Russians by paying for the dossier? Tychicus, You and other Trump Cultists are becoming more and more comfortable attacking law enforcement every day. Democrats do that all the time. Did you ever watch the local news in San Antonio or Austin? The mother and sister of every criminal caught or shot by the police always claims they were innocent. I saw all of the Carter Page interview. In true Trumpian fashion he repeatedly refused to answer real simple questions about contents of the FISA requests. He was much less believable that the criminals we see on DFW TV and their mamas. It is pretty clear that someone coached him but he was still an embarrassment. Tychicus , Just answer one question: If Hillary was Comey’s “favorite candidate”, why did he publicly scold her against normal Justice Dept policy and then announce the discovery of the Weiner emails (again against policy) right before the election while keeping the Russia/Trump investigation secret until after the election? When Trumpkins allege FBI favoritism toward Hillary while being completely unable to answer or even acknowledge that question, it makes the 53% completely discount and/or ignore anything that comes from The Cult. I hope you are in the Czech Republic. My car thermometer just read 114 degrees. It is reminding everyone of 1980. They already answered this for you. Pay attention. Because they thought she had the election in the bag and that it would do no harm. How could she possibly lose? was the thinking. And you thought it too, and you know it. So Page refuses to answer questions as advised by his lawyers and it proves his guilt, yet when Strzok did the same it was some noble act against those wrongly accusing him. A little consistency from you would be nice. So would you acknowledging the truth for a change. I not only paid attention, I read Comey’s book. Has the Cult? Comey was not trying to help Hillary when he scolded her in July and announced the discovery of the Weiner emails in October. In fact, he knew he might be helping Trump. One of Comey’s aides warned him that the Weiner announcement could lead to Trump’s election. Why did Comey, Strzok and the rest take extraordinary steps to keep the Russia/Trump Investigation secret until after the election if they were trying to help Hillary? I am not faulting Comey. I have read his explanations and would not second-guess him. He had to make some very tough calls – on the scolding, the Weiner announcement and on keeping Trump/Russia secret until after the election. It so happened that all of those decisions favored Trump. That is why the 53% thinks Cultists are brain-washed when they say Comey favored Hillary. Tychicus, Charlie Sykes fleshed out the outline I gave you @12:57. The FBI used media articles (page 21, 22, 24) that were the results of leaks to the media. On page 23 the FBI correctly states that Chris Steele was *not* the source of one of the articles; They only knew this because they, the FBI were the source of the leaks which led to said articles. They cited their own leaks as confirmation for the original application. This whole thing is a sham. And Ricky’s OK with that kind of malicious misuse of our court system, as long as it’s used against his political enemies. And The Police is always trying to git my poor boy. And he fully supports this guy. Comey has NOT been telling the truth. He pretended the “dossier” was only a minor part of the warrant application that he signed to wiretap, claiming it was NOT a “critical part of it” and there was a “significant amount of additional material.” Demonstrably untrue. His book on the subject comes out Tuesday. Should be an interesting read. Newly released documents prove that Comey’s FBI and the DOJ relied almost entirely on the phony and unverified anti-Trump “dossier” to gain warrants to wiretap Trump campaign associate. The “dossier”, paid for by Clinton & Democrats, was about 95% of the application to spy! I spend an entire chapter laying out this same evidence in my book, “The Russia Hoax: The Illicit Scheme To Clear Hillary Clinton And Frame Donald Trump”. The book comes out this Tuesday. These new documents corroborate what is in the book. I hope you’ll read it. And Page is not my political enemy. He is a moron. Didn’t you watch the interview? Gregg Jarrett works for the American Pravda (Fox News) which was absolutely critical in convincing the weak-minded to vote for Trump in the primaries. Like fellow cult priests (Hannity, Ingraham, Pirro et al.) he will make money selling his books to brain-washed cultists. Now that Trump University has closed, the gullible have to be fleeced in new ways. The Cult does seem to be splintering. After Trey Gowdy was critical of Trump’s Helsinki performance, some of the Cult now believes that Gowdy himself is a tool of the Deep State. Like Jeff Sessions, the Deep State has some serious dirt on the formerly patriotic Trey Gowdy. I am going to label this branch of The Cult as The Fundamentalist Trumpkins.